Meghan, the Duchess of Sussex and Prince Harry broke royal protocol countless times on their wedding day–while still managing to host an event fit for royalty. 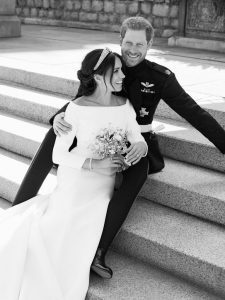 There were large doses of American traditions embedded in the couple’s classic English royal proceedings at St. George’s chapel at Windsor Castle, and those moments of Markle’s personality, heritage and influence transitioned seamlessly into the reception. Case in point: the wedding’s evening reception at Frogmore House, hosted by Prince Charles and Camilla Parker Bowles, where the bride made a toast. Unlike American weddings where speeches from the couple, their best man and maid of honor and parents are common and often tweaked based on the couple’s preferences, English royals follow the rules–the best man makes a speech, as does the host (in this case, Harry’s father, the Prince of Wales) and the groom may say a few words. The bride, traditionally, is off the hook. However, per her vibrant personality and forward-thinking midset–Markle is not one to take the easy route. The bride, according to Us Weekly, delivered an emotional speech in a custom Stella McCartney gown at her dinner reception, thanking her mother and her in-laws for all their love and support, and her new husband, who she said she “loved with all her heart.” Referring to the dissolution of her first marriage, the bride also was reported to say in front of the couple’s 200 guests that finding love was “worth the wait.” She told him that she knew he was “the one,” and that she could not wait to start their next chapter together. To her mother, the bride, 36, was quite emotional. Us Weekly reports that Markle turned to Doria Ragland and said, ‘You have always been there for me through everything” Apparently, the bride did not mention her father, Thomas Markle, who was unable to attend. The bride also go teary-eyed as she thanked her in-laws for being gracious hosts and for welcoming her and her mother into their family.